MB Balinese Astrology works on the Bali astrology principles and finds out your Balinese astrology sign or Balinese sign. 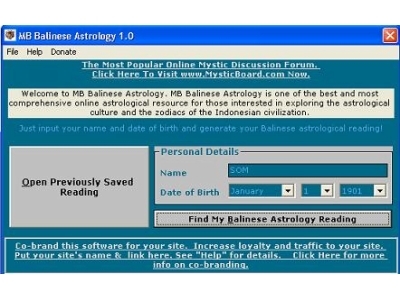 Apart from telling you your Bali sign, this Bali astrology software also tells you the attributes of your Balinese astrology sign. The Bali astrology reading delivered by MB Balinese Astrology gives you an insight into the characteristic features, positive and negative personality traits, career finance and health issues. The speciality of Bali zodiac signs or Bali astrology is that the Bali astrology calculation are based on the Pawukon calendar that has been used in Bali, since the 14th century till present times. This Pawukon calendar has 210 day and shows ten different weeks simultaneously. These weeks are of different durations. If one week consists of only one day, the other has ten days in it. The Balinese signs or Bali zodiac signs are 35 in number. If you want to know which of these 35 Bali signs is yours, you just have to download MB Balinese Astrology Software and get a free Bali astrology analysis.